The tradition of saffron in Abruzzo dates back to the Roman times. Mentions about it are found in Ovid’s “Metamorphoses”, writer and poet of ancient Rome who was born in Sulmona in 43 b.C. During the period of the Roman Empire, nobles used to spend their summer holidays at Fucino lake, where the microclimate surrounding the area was particularly advantageous for wheat, olive tree and saffron cultivations. Saffron became synonym of luxury, as it was used also for scenting the temples during religious ceremonies and making love potions, since it was considered aphrodisiac. At the beginning of 1300, after a tough period, saffron became an important source of wealth for the city of L’Aquila and nearby territories, as the cultivation area was very vast, including the municipalities of San Demetrio ne’ Vestini, Magliano de’ Marsi and Sulmona. Rustichella d’Abruzzo is proud to offer its estimators from 70 Countries in the world the best “red gold” of the Abruzzo region. 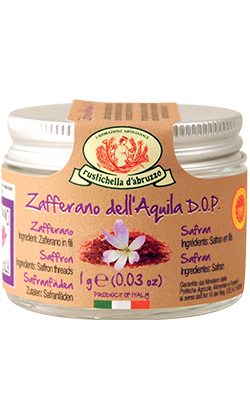 Rustichella d’Abruzzo, committing to always promote the top-quality products of the territory, started the direct production of saffron collaborating with skilled farmers of San Pio delle Camere, in order to offer its many estimators a purple-coloured speciality of Abruzzo that has a unique taste and perfume. Harvested at sunrise and selected by hand, it is put in a small jar of 1 g which preserves all the essence and history of Abruzzo. Try it with our RAPIDA Spaghetto 90 (cooking time 90 seconds), leek fondue and crispy cheek lard, following the recipe of the Michelin-starred Chef William Zonfa from L’Aquila.